Almer Imamovic, Classical guitarist, and member of the ALMANOVA DUO, recently chose a Hill Standup Signature model as his performance guitar. 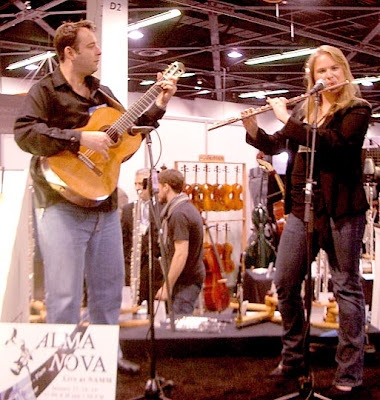 He played it with Jessica Pierce, flutist, at the NAMM show in two booths. Tornavoz music booth #5894 and Gemstone booth January 17, 18 and 19 at 11AM and 1:30PM booth 3512. AlmaNova is a talented, classically trained flute and guitar duo presenting an eclectic program of styles from music all over the world. Each of these diverse musicians has been trained in the classical tradition while exploring other types of music. This great love of all musical genres shines through to their audience by way of dynamic performances and mesmerizing stage presence. AlmaNova has traveled all over the world playing their unique blend of music from the Balkans, Spain, Latin America, and the British Isles. Please visit us at the Anaheim Namm show January 17-20, 2008 our booth #1421. We'll have a selection of SIGNATURE guitars, including the Standup model, a variety of Master Series models including Rodriguez, Torres and Reyes, the new FUSION Crossover and many more. Please contact us if you'd like to make an appointment with Kenny.